This weekend my husband and I ventured out to Michael's. As I think about making some 3D robots again, whether I buy anything or not, going to Michael's always helps to spark some new ideas. I like to go to the hardware store and the antique mall for the same reason - seeing different things oftentimes takes me in different directions or makes me think differently about a problem I'm trying to solve. We walked around the store for a bit and I ended up getting some wooden squares (one can never have too many of those! ha!) and these little pieces of birch plywood with rounded corners. My friend Hella (previously mentioned here) has used these from time to time but for whatever reason, I've never bought any. Well, I'm really glad I did because I ended up trying them out today and I really kinda dig 'em! 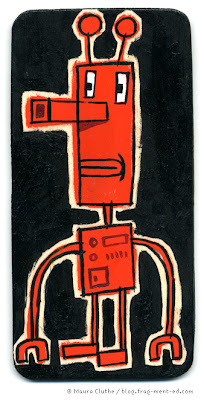 I mixed up some red-orange paint for another project and had some left over so I did a couple of ten-minute paintings. It was really fun! Now I wish I'd bought more of these boards. Guess I'll have to make another trip! The orange robot looks so happy!! I love Michaels! And those wood squares are awesome.. I bought so much of their wood products too. Couldn't help it. your work is like a breath of fresh air! loving it! 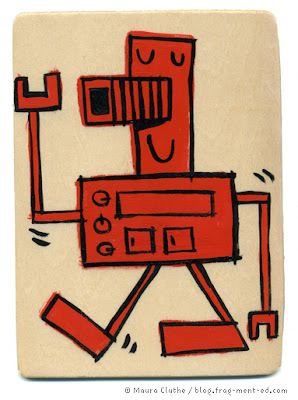 i'm diggin those 10 minute robots and ink soakin in birch.mmmmm.